In addition to my family, friends, and faith, I have two other primary passions – juggling and theater. I’ve been a Musical Theater Critic for the past 17 years, seeing around sixty musicals a year and writing reviews for Talkin’ Broadway. So, it shouldn’t come as a surprise that I decided to write an article about jugglers on the Broadway stage. There have been hundreds of shows that have included some form of juggling, but certain ones showcased famous jugglers, featured juggling prominently, or was a show specifically for jugglers and/or circus arts. 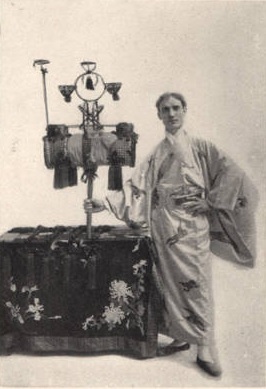 Way back in 1911, Japanese juggler Youna performed in the Broadway production of the play Kismet. He juggled in a bazaar scene early in the play, and then performed an entire act in front of the curtain between the 2nd and 3rd acts. Many critics cited the positive audience response to his act as one of the highlights of the production. Youna remained with the cast of Kismet for five years. You can read more about the unique life of Youna in a previous eJuggle article by clicking here..
During World War II, juggler Larry Weeks was drafted into the U.S. Army. Not long after, composer Irving Berlin saw his juggling act and arranged for Weeks to be transferred to the company performing Berlin’s show, This Is The Army. 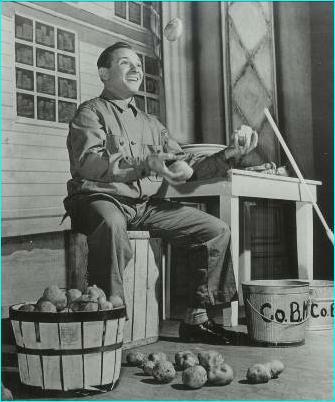 Larry’s juggling routine featured Corporal Weeks juggling potatoes instead of peeling them, and also juggling knives and forks. He did some flag twirling and performed a rifle drill with a mop in the show as well. This Is The Army toured military bases all over the world before playing Broadway. 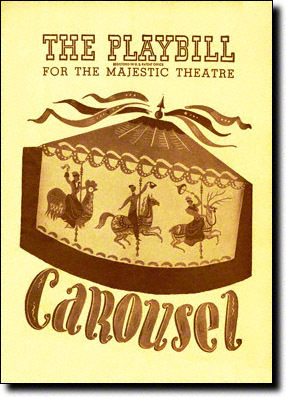 In the original production of the Rodgers & Hammerstein musical Carousel, which ran from 1945 – 1947, the show featured a character named “Juggler.” Lou Folds originated the role, and was eventually replaced by Walter Hull. 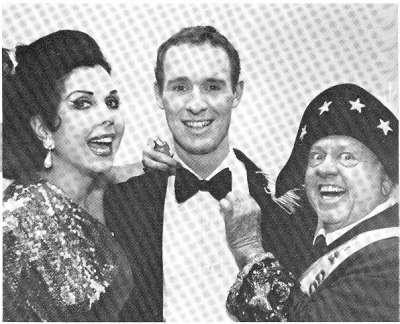 When Judy Garland’s Broadway show At Home At the Palace opened in 1967, Francis Brunn was a featured performer, allowing Garland to change clothes and rest a bit, and providing the audience with variety and the opportunity to see one of the greatest jugglers of all time on the same bill as Hollywood star Garland. The musical Sugar Babies, celebrating the life of burlesque, opened on Broadway in 1979. During much of the three year run of the show, comedy juggler Michael Davis performed in a featured spot. Here and here are a videos of Davis not long after Sugar Babies. 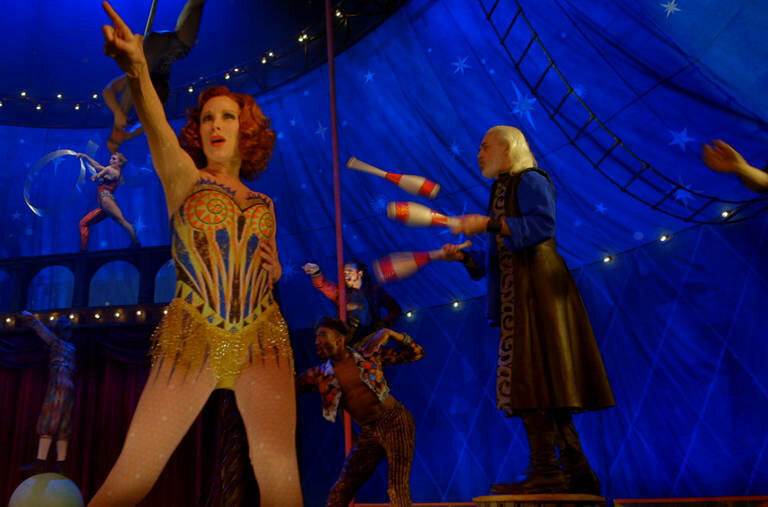 The musical Barnum premiered on Broadway in 1980. Famed juggler Fred Garbo was a creative consultant for the show and also appeared onstage as its primary juggler. In the London production of the show, Michael Crawford, who would go on to star as The Phantom of the Opera in London and New York, played PT Barnum, and juggled, as did most of the rest of the cast. The Flying Karamazov Brothers have had three shows on Broadway. Their comedy juggling act Juggling and Cheap Theatrics played the Great White Way in 1986. A year later, they performed a very unique circus/juggling version of Shakespeare’s The Comedy of Errors on Broadway with Avner the Eccentric and a mix of other circus performers and Broadway talent. It was subsequently broadcast live on PBS. The show is online on Youtube here and here. The brothers played Broadway a third time in 1994 with their show Do The Impossible. Broadway actor Terrence Mann has starred in shows such as Cats, Les Miserables, and Beauty and the Beast and received two Tony Award nominations. He was an original cast member of Barnum back in 1980 and juggled clubs in that production. In 2013, he played the role of King Charles in a circus themed revival of the musical Pippin on Broadway. A number of cast members juggled, and Mann juggled clubs and knives, and also rode a unicycle. Click here to see Mann juggle. 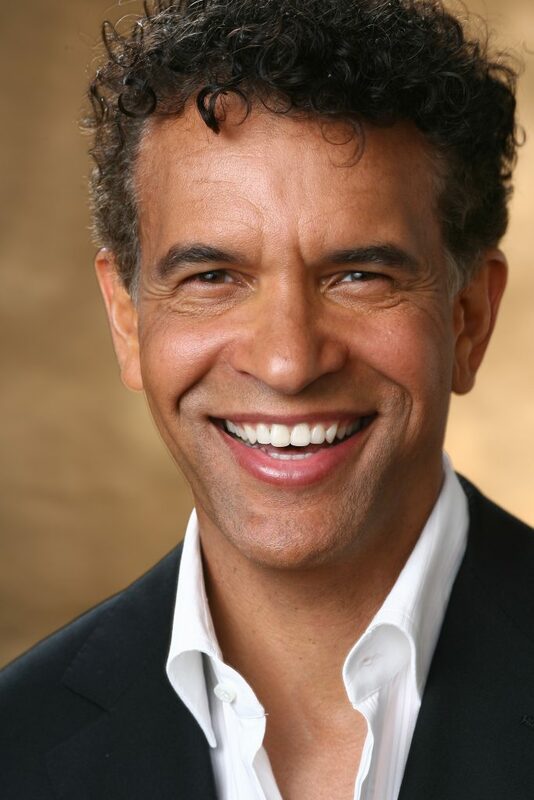 Brian Stokes Mitchell has four Tony Award nominations, and one win, and is another actor to juggle in more than one Broadway show. 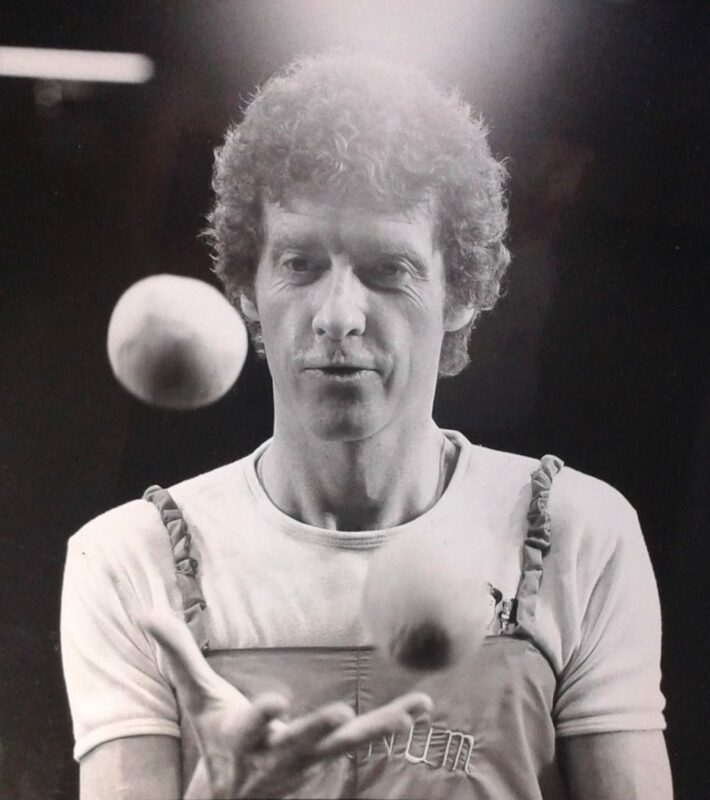 In the musical Mail (1988), he performed some fairly basic juggling. In 1998’s Ragtime, he was the central character and did some smooth hat manipulation. There have been a number of Broadway shows that have featured circus arts as a framework for their storytelling, and 2016’s Paramour, created by Cirque du Soleil, featured a number of jugglers, including 2013 IJA champion Kyle Driggs. During the run, Sean Blue also appeared in the show. Here’s a clip featuring diaboloist Zhengqi Xia and Driggs. Scott Cain is an IJA Life Member, IJA Numbers Championships Co-Director, a former Numbers gold-medalist, Teams medalist as a member of Raising Cain, Musical Theater Critic for Talkin’ Broadway (Cincinnati/Dayton), and assistant curator/researcher for the Historical Juggling Props Museum (www.historicaljugglingprops.com). He and his family live in Cincinnati, Ohio (USA).